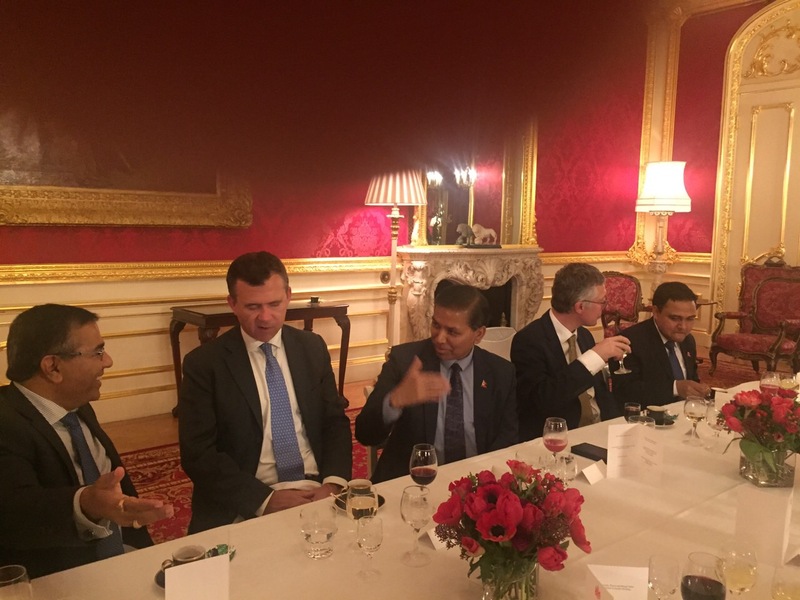 During the Bilateral Consultation Mechanism (BCM) between Nepal and the United Kingdom. 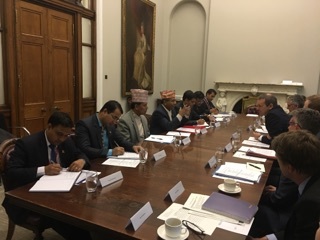 The fourth meeting of the Bilateral Consultation Mechanism (BCM) between Nepal and the United Kingdom was held at the Foreign and Commonwealth Office in London today. 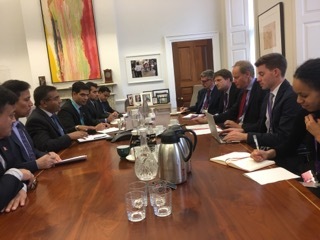 Foreign Secretary Mr. Shanker Das Bairagi and Permanent Under Secretary and Head of the British Diplomatic Service Sir Simon McDonald KCMG KCVO led their respective delegations to the meeting. 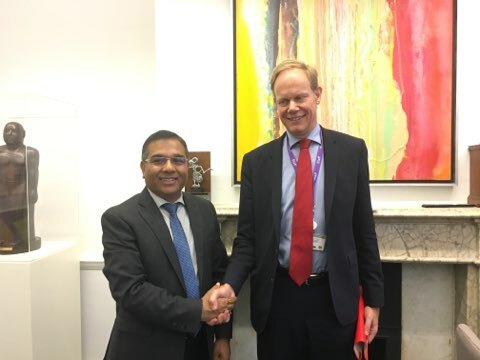 Both sides took stock of the existing Nepal-UK bilateral cooperation and deliberated on the ways to further consolidate and promote mutual cooperation in the future. They agreed to enhance bilateral relations with an increased focus on economic engagements especially in the areas of trade, investment and tourism, among others. Exchange of high-level visits, cooperation on education and culture, air safety and people-to-people contacts also featured during the discussion. They also shared views on finding solution to the concerns of the Gurkha Veterans. The two sides also agreed to work collaboratively at the regional and multilateral levels in order to promote rules based international system and the matters of mutual interests. Following the BCM meeting, Mr. Bairagi had a meeting with the Rt. Hon. Mark Field, Minister of State for Asia and the Pacific at the latter’s office and discussed wide ranging matters pertaining to long-standing partnership between the two countries. Yesterday evening, Mr. Bairagi had a meeting with the Rt. Hon. Mark Lancaster, Minister of State for the Armed Forces, at the Lancaster house in London. The two sides discussed issues pertaining to Gurkha Veterans. 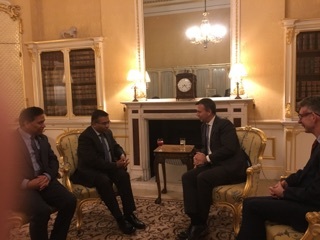 While in London, the Foreign Secretary also had a meeting with H.E.Mr. Matthew Rycroft CBE, Permanent Secretary of Department for International Development, H.E. Mr. Kitack Lim, Secretary General of the International Maritime Organization (IMO), H.E. Mr. Moin Ahmed, Director General of International Mobile Satellite Organization (IMSO). In all meetings, Mr. Bairagi was accompanied by the Ambassador of Nepal to the UK, H. E. Dr. Durga Bahadur Subedi, Joint Secretary Mr. Ravi Shanker Saiju at Ministry of Industry, Commerce and Supplies, Joint Secretary Mr. Ghanshyam Bhandari at Ministry of Foreign Affairs, Under Secretary Mr. Yuga Raj Pandey and other officials from the Ministry of Foreign Affairs and the Embassy of Nepal in London.